The move aligns with Delta's focus on international growth. About one-third of the airline's current operations are outside the U.S. Bastian would like to see that grow to about 50 percent. Delta formed a similar JV partnership with Aeromexico last year, which Bastian said will mirror what the airline is doing with its Korean partner. "We get a lot of questions about connecting Minneapolis to Mexico City, and we aren't ready to announce that, but it's clearly our goal to be able to fly that, Bastian said, "so i think you will see us do that in the not too distant future." Thank god we're getting ICN. Asia connectivity has sucked since Narita went away. Haven't flown Delta the last several trips. Mexico city is cool, also. Should make it a hell of a lot easier to fly to Oaxaca. Northwest and/or Delta tried MSP-MEX years ago. Didn't last long, but hopefully with the joint venture with AeroMexico it has a better chance. AeroMexico even applied to start MSP-MEX a decade ago. They got approval, but never started it. I've noticed many more flights taking off to the south recently, across the river. Anyone know what's going on with that? It's become quite the topic of discussion on my local Nextdoor, where people are complaining about the noise. I think the complaints are silly; it's really not that bad, but I am also curious about why things may have changed. While we're complaining, I have noticed a lot more flights coming in low on approach over South Minneapolis during what is supposed to be the after midnight quiet hours. All else equal, planes take off into the wind and land with the wind at their backs. Actually, planes take off into the wind and land into the wind. That's a constant at every airport. Taking off into the wind gives faster lift, and landing into the wind creates more drag. Both help with what the plane is trying to do at that moment. The south takeoffs over the river are more common in summer, due to the winds being more south/southwest during the warmer months. With NW takeoffs and approaches during the winter months being most common. Obviously that depends on fronts, etc. As for low approaches, I'm pretty certain ATC has the planes approach on a very common path, always - regardless of the time of day. They are incredibly consistent in that way. I also don't know that there's any actual 'law' about nighttime flight times, I think it's more an agreement. But demand will likely always push those limits - as does weather-related delays elsewhere, that could impact a flight returning later than scheduled. What he said. However, the runways at MSP are long enough and our winds light enough at times (i.e. drag and lift from the wind are not as much of a factor) that tailwind landings are seen. (See this dated thread on airliners.net that refers to DC-10 and 747 use, but point stands). You do see takeoffs on 17, while landings are on 30s. I honestly expected that as MSP rolled out their Optimized Profile Descent procedures that impacts to residential area further from the airport should have been significantly reduced. Unfortunately, I haven't noticed any improvement related to that. Anecdotally, it seems like the ULCC's (Frontier, Spirit) have been adding some very late arrival times. The InterContinental hotel has had its small surface parking lots and access roads paved, and lights are starting to come on in the lower levels. 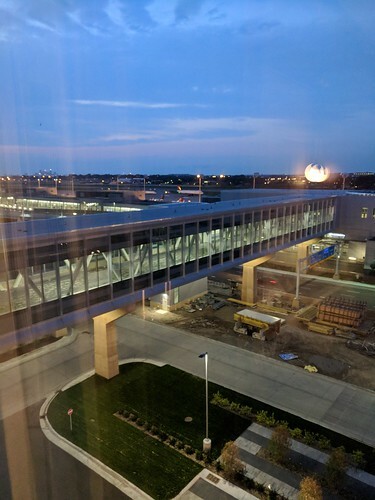 I stayed at the new MSP InterContinental hotel couple nights ago as my flight out of MSP was 6 in the morning, and I really did not want to wake up at 3am to drive to the airport. Overall, it was a good stay, but there are some catches I didn't expect when I booked. 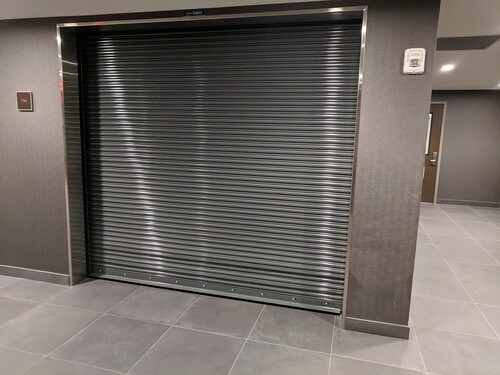 It is really hard to get to the hotel from the landside, before security, to the hotel, especially if you are not driving as there is no direct connection from the ground transportation building to the hotel. You must call the hotel ahead of time to arrange a shuttle pick up. We took the light rail to the airport and could not figure out how to actually get to the hotel for a while. The dedicated TSA checkpoint opens at 5am, so that worked out pretty well for me. It took less than 30 minutes from the hotel bed to my airplane seat. It's on the 3rd floor of the hotel and they necessarily don't check if you're a hotel guest or not, so if you can 'sneak in' past the hotel check-in lobby, I guess anyone who's in a rush can use it. For now, the checkpoint seems practically empty. Thanks for sharing! I do hope they'll figure out a better way to connect transit to the hotel, for a multitude of reasons! They plan on having like 4 different restaurants plus the observation bar that I'd like to check out, without needing to drive there. I hope the airport has a long-term plan, especially once the new parking ramp is completed, to make that happen. Calling the hotel for a shuttle is insanely stupid! 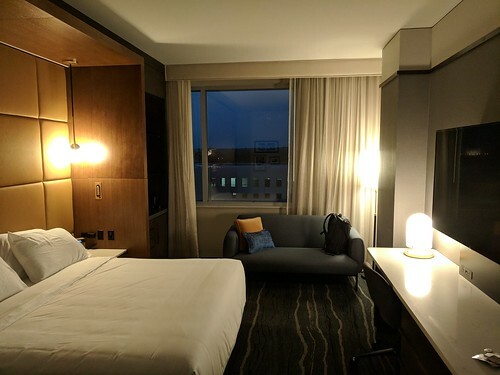 Count me as someone else who also wanted to check out the hotel and the observation bar, and expected to simply get to the light rail station and be able to walk landside. It's cool to see our non-stop, international destinations increase in number. Aer Lingus is starting direct service from MSP to Dublin next summer. Here's the star tribune link as well! Travel Extra says Airbus A321 LR, Strib says Boeing 757 - comparable, but still interesting that they differ. 757 may be a placeholder, as they'll be just starting to take delivery of their A321's in 2019.